HopeNow Furniture Bank of Knox County has recently added to its facilities a basic furniture-building and repair shop featuring the latest in power tools and carpentry equipment. Designed to alleviate periodic shortages in donations of bed frames, tables, and dressers, the shop is able to build basic models on relatively short notice. 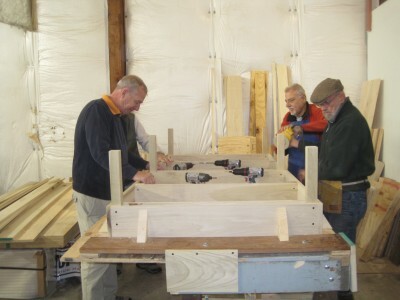 Under the oversight of Marshall Winkle, and assisted by Al Gore, Joe Zagula, Terry Walter, and other volunteers, three single bed frames can now be built in just over three hours. Already, more than a dozen of these bed platforms have been given free of charge to families in need. To lessen the loss of warehouse space, the new facility was constructed in a manner to provide an area for light storage above the shop. Bob Ready, HopeNow’s warehouse manager, stated: “The carpenter shop has been a great addition to the Furniture Bank. Not only can more extensive repairs be made to donated items, but furniture pieces such as kitchen tables and twin bed platforms can now be manufactured on site. This gives HopeNow the ability to provide beds to children who might otherwise have to sleep on the floor”. The workshop occupies a corner of HopeNow’s 9,600 square foot warehouse at 1025 S. Main St. in Mount Vernon and was made possible with grants from Ariel Corporation and the Community Foundation of Knox County. Lumber has been generously provided by Brenneman Lumber Company along with a $500 grant from Harcourt Parish, helping to significantly reduce the need to purchase building supplies. A combined HVAC unit to keep temperature and humidity levels at a constant was installed with funds from a second grant from the Community Foundation of Knox County and individual donations. Funds from the Elks of Mount Vernon #140 have also provided generous support. HopeNow Furniture Bank of Knox County is a tax-exempt charitable 501(c)3 organization that serves to provide household goods to those individuals and families of Knox County struggling to furnish their own homes due to poverty, crises, and other challenging life experiences. HNFB collects used household goods from donors and distributes them without charge to qualified families in need. Hours of operation are Tuesdays, 1 – 3:30 Thursdays, 10 – 12:30. See us on our webpage, www.hopenowfurniturebank.org, on Facebook, Twitter, and Instagram. HopeNow Furniture Bank is always in need of donations of beds and gently used mattresses, twin, full, or queen. Persons may call 740-358-2998 for free pick-up of donations or access the donations form on our website.